Content that engages the industry. Since 1976, AQUA Magazine has empowered spa and pool professionals through timely articles on the news, information and insight they need to guide their businesses and help them grow. 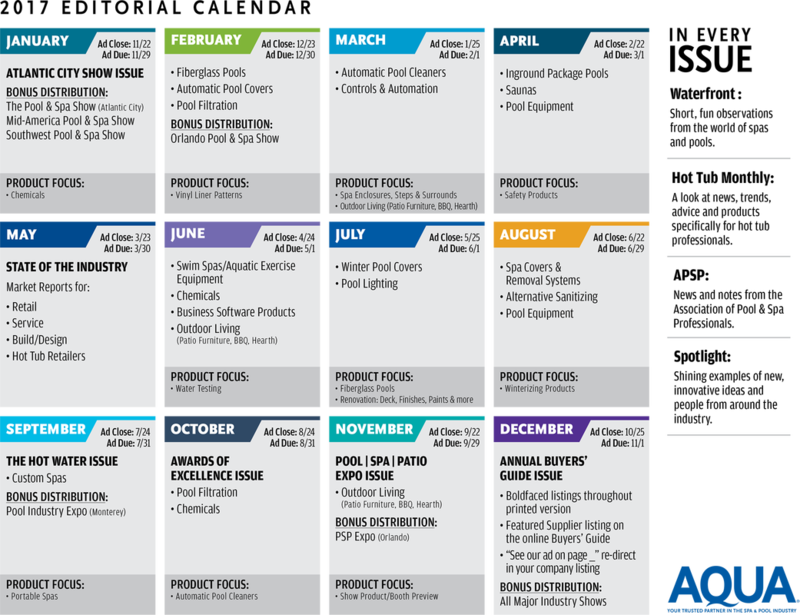 We are excited to continue this commitment throughout 2017 and we have an awesome editorial lineup in store, including the State of the Industry report, Hot Water issue, Awards of Excellence issue, PSP Expo issue and the annual Buyers' Guide. Sent monthly, AQUA is the ultimate destination for your company to showcase your products and services year-round to our 15,000 audited magazine subscribers. Take a look at what we have in store for 2017 and secure your ad space today!